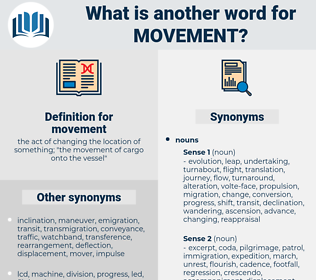 What is another word for movement? 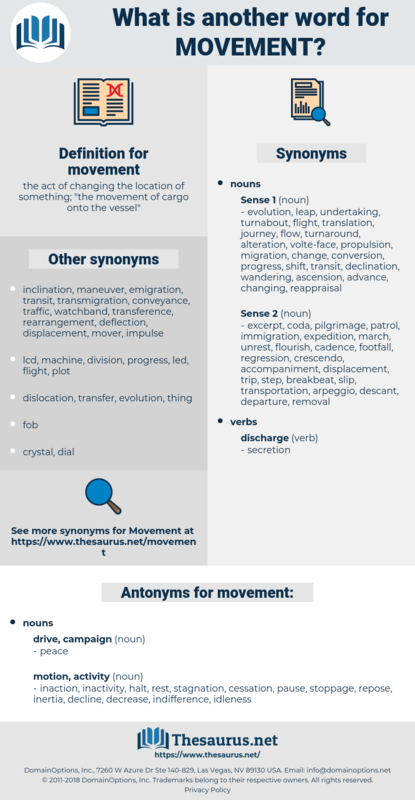 the act of changing the location of something; " the movement of cargo onto the vessel"
migrations, dislocations, Journeys, crossings, outflows, upheavals, swings, campaigns, displacement, displacements, relocations. insurgents, Achievements, victims, movimiento, Motions, movimento, moving. protests, activists, volumes, Trajectories, travellers, workouts, balances, counterparts, athletes, absences, pressures, Vehicles, forces, Exercises, meals, Miles, games, members, Realities, visits, roadways, expenses, fleets, runs, streets, highways, Motions. Narrows, manoeuvre, moving, activism, resettlement, commute, dislocation, circular. circulated, started, said, Had, Got. organised, organized, involved, increased, confused, Launched, used, seen. Expeditions, fluctuations, rebels, circulation, campaign. inaction, inactivity, halt, rest, stagnation, cessation, pause, stoppage, repose, inertia, decline, decrease, indifference, idleness. immobility, discontinuance, shutoff, deliberation, finish, lapse, stillness, quiescence, quiet, expiration, suspension, stop, inertness, motionlessness, surcease, shutdown, suffering, endurance, passion, ending, termination. The shock had paralysed every movement in the villain's body, but the movement of the blood. displacement, descent, lurch, deracination, retraction, speeding, agitation, stream, conveyance, flow, everting, lowering, maneuver, pitch, circumduction, return, rotary motion, transferral, insertion, kick, hurrying, inclining, rush, pursuit, waver, eurythmy, quiver, abduction, procession, reclining, prostration, standing, transportation, translation, flit, travel, vacillation, wriggle, straddle, eurythmics, jerking, inclination, fetal movement, eversion, dart, rushing, jerk, disturbance, onward motion, advance, kneel, locomotion, shift, approaching, slide, flutter, transport, progression, reach, eurhythmy, play, ascent, glide, squat, snap, transfer, lunge, wiggle, retroflection, reaching, toss, ascending, Pursual, eurhythmics, slippage, reciprocation, travelling, quivering, transplanting, transplant, troop movement, Body English, upending, flicker, crawl, inversion, haste, pitching, traveling, sweep, forward motion, retroflexion, following, rise, jolt, kneeling, stretch, shutting, kicking, chase, advancement, ascension, coming, span, Saccade, headshake, wave, speed, adduction, migration, swing, squirm, shifting, posing, headshaking, letting down, Eye Movement, progress, introduction, opening, vibration, approach, closing, sitting, squatting, coast, gesture, rotation, swinging, manoeuvre, stroke, intromission, hurry, transplantation, Foetal Movement. musical composition, piece, composition, opus, piece of music.